Where I am this year, purchase-wise anyways? Okay, this stuff is timeless and I probably would have been interested last year-- but I wouldn't have appreciated it like I do right now. Natural dyeing wasn't even a blip on my radar a year ago, and now it's just one of those (few) things that have caught my attention and won't let go. This stuff is just insane. I saw these "batt rolls" at aVfKW's open studio a few weeks back but my son distracted me from any purchases... and when I saw this gorgeous green at Lambtown I couldn't resist. I'm glad-- I've already finished a project in it! 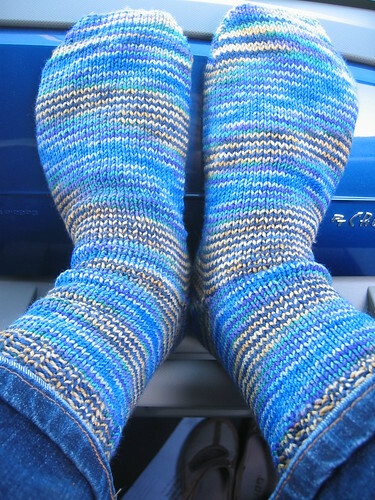 (Next time, haven't decided about blocking yet.) Kristine sold out of them at Lambtown but will have more in a few weeks-- really cool stuff, seriously. Even more serious? 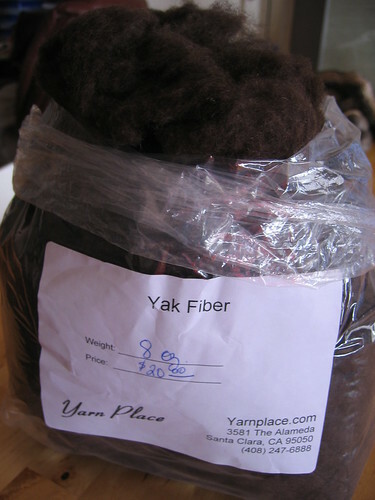 Eight ounces of yak fiber. I KNOW!! It's a lot of yak :) Even more when I remind you I already have 2 - 8oz bags of this stuff (so, 24 oz total in my house right now)... but it's so soft!! :) I'm thinking about sending some fiber out to be processed and blended though, and this was one of the possible blends I was kicking around. Fiber out? Oy no, fiber in. Seven and a half enormous pounds of greasy, lovely, chocodile goodness. The best part though? Even though its a merino, its staple length is on the long side of what In Sheep's Clothing says it should be-- 4". 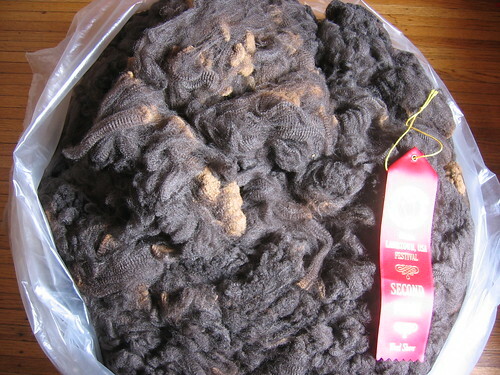 Judged in the 1/2 blood class, perhaps my favorite since I'm just in love with length for combing but am still a sucker for soft, there's a lot of room for potential in this fleece. 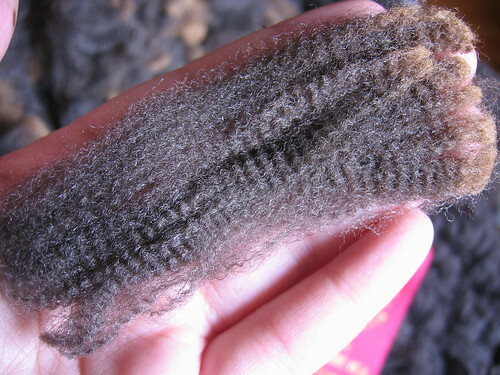 It is so large that I may properly roll it out and separate by lock length, keeping the longest bits for combing here at home and either sending the rest for processing at Morro Fleece Works or even destashing some. Listening to the judge was mindf*ing bliss. 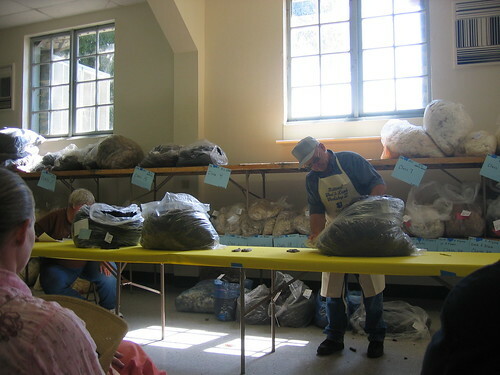 I was literally in awe of watching him work, all the while engaging the audience and teaching not only what he was looking for in each wool class but dropping random things that my eager ears swallowed whole (the length of your thumb from joint to tip is 2.5"; fleeces progressively break from the belly up to the shoulder, so a small good show fleece may have been a larger, broken one; wool smolders while mohair lights up incredibly fast; the better fed a sheep the coarser the wool; the productivity of a fleece can be guessed just by picking it up and seeing how it weighs down in your arms; etc. 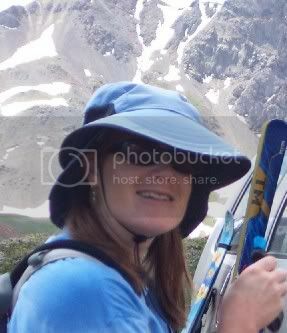 and be sure that I could go on and on...) This is really the experience I wanted and got, ten times around the world over. The most unexpected part of the day? Til then, not soon enough! Sounds like it was a great weekend! I love everything you've shown from A Verb for Keeping Warm. You must have the best fibre stash ever! 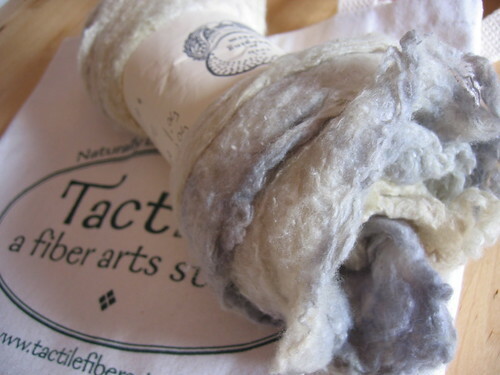 mmmm, I shuddered with delight at that merino fleece! 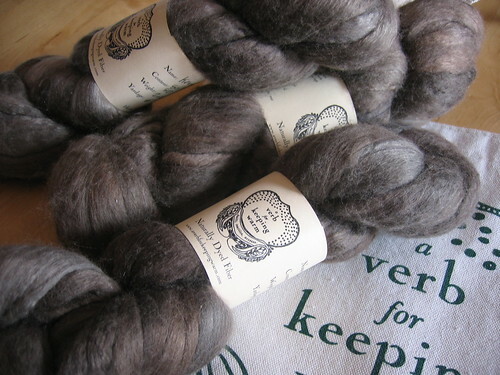 Our merino/corriedale x's are offering us up some beautiful, rich chocolate fleeces and I am loving the combo of the merino crimp and longer staple of the corriedale. Now you've got me hungering to flip my queue of 'to be spun' fibers on the floor and get right down to it! Oh, and I am sharing my art award with you - on the blog! I LOVE fiber festivals. I'm sad that there aren't any here until October. Lovely fleece too. mmmm. Morro. I just got my first Morro fleece back yesterday and it makes me sad I'm at work. I love coming here and seeing what you've been working on. I especially enjoy the excellent pictures detailing the waviness of the fleece! 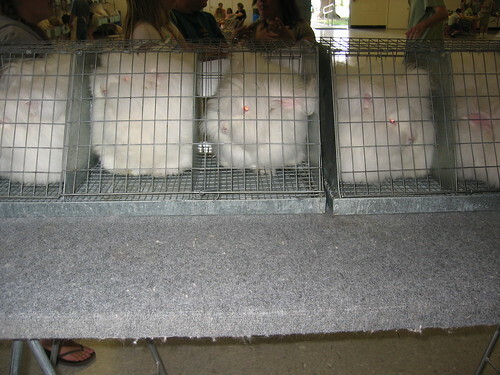 I have an aversion to anything requiring more care than a pet rock, but I would have been hard pressed to not want one of those bunnies!